Come winter, the shivering grasshopper calls a press conference, demands to know why the ant should be allowed to be warm and well fed while others are cold and starving. 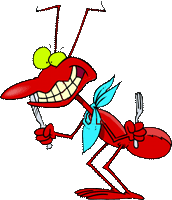 SABC1, 2 and 3 show up to provide pictures of the shivering grasshopper next to a video of the ant in his comfortable home with a table filled with food. The world is stunned by the sharp contrast. TV commentators explain that the ant has gotten rich off the back of the grasshopper, and there are calls for an immediate tax hike on the ant to make him pay his fair share. Finally, the Government drafts the Economic Equity & Anti-Grasshopper Act retroactive to the beginning of the summer. The ant is fined for failing to hire a proportionate number of green bugs and, having nothing left to pay his retroactive taxes, his home is confiscated by the government and handed to relatives of the grasshopper. The grasshopper instigates a lawsuit against the ant, and the case is tried under the watchful eyes of the trade unions. The story ends as we see the grasshopper finishing up the last bits of the ant's food while the government house he is in, which just happens to be the ant's old house, crumbles around him because he doesn't maintain it. The ant has disappeared in the snow. The grasshopper is found dead in a drug related incident and the house, now abandoned, is taken over by a gang of spiders who terrorize the once peaceful neighbourhood. Be VERY careful how you vote on the 18th of MAY 2011!! We will be bringing update comentary throughout the day on Wednesday 18 May. Postings will be placed as they come in, and editing will continue later.